Siri FAIL! 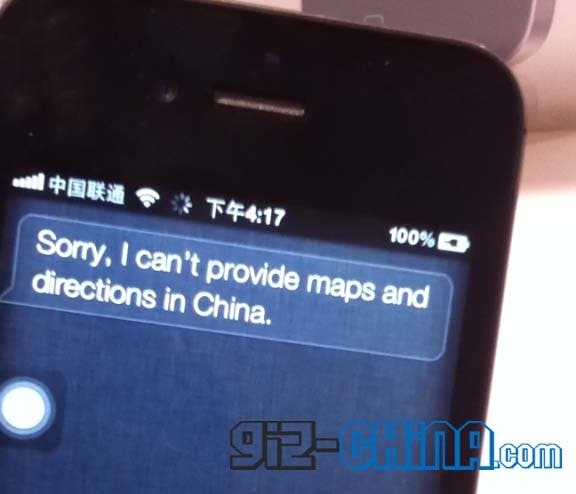 : Siri Can’t Give Maps Or Directions in China! Well we all new Siri can’t understand the Chinese language, and she sometimes has problems with accents, however we didn’t know (until a few days ago) that Siri is pretty much useless in China even when spoke to in English! I popped in to the local Apple store here in Qingdao, China (there are actually about 15 local Apple stores here!) and decided to play about with the iPhone 4S with the thoughts I might be won over and buy one! How wrong was I! In the video below you can see that Siri tells me repeatedly that locations, maps and directions are not available in China even when speaking English! Which for me makes the iPhone 4S useless. The strange thing is when asked the time Siri know which city and country I’m in, but still says my location isn’t available in China!? Does this mean that Siri fails in China completely or that Siri’s location services are banned in China? Previous Siri Can't Understand Chinese and its really Annoying! Next iPhone 6 Released in China Already!